The market is a little cluttered. For the time being, it would not be easy for trading. Gold: Gold is trapped between resistance and support. 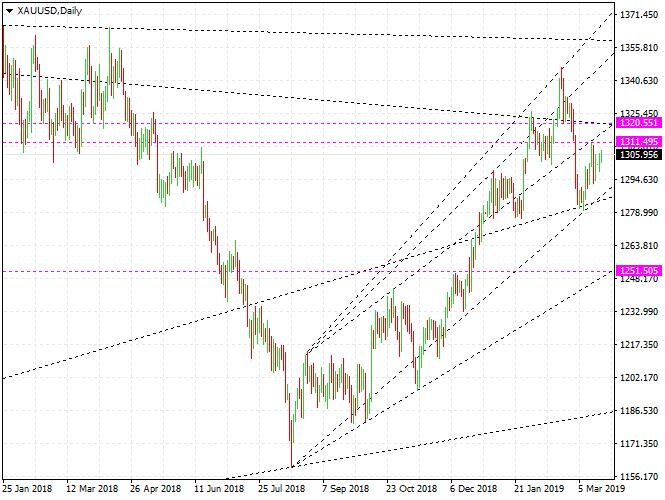 XAUUSD is likely to decline further. The important price line is $ 1311. If it goes over $ 1311, it would be better to look for opportunities to sell. The silver prices seem to be hard to rise. The XAGUSD is stuck between $ 15.6 and $ 14.95. $ 15.6 will be a strong resistance line. If it climbed over $ 15.6, it would be better to look for opportunities to sell. WTI: The oil market is very unstable. Such a situation will push up oil prices. WTI is rising as expected. The WTI is likely to climb to at least $ 63. Brent oil is likely to rise to $ 71. Natural gas is also likely to rise slightly and the resistance line will be $ 3.04. Euro: The euro is rebounding strongly. EURUSD is in a downward trend. It would be better to do sell-trading. The important price line is 1.1373. USDCAD is on an upward trend. If it falls below 1.32, it would be better to look for buying opportunities. The important support line is 1.31. SP500: Stock indices are rising as expected. They can not but push the stock index up. They are using all means and will do so in the future. In January, I expected the S & P 500 index futures to rebound to 2850. Now they are very close to the target price. It is better to pay attention.